Time to CELEBRATE with a sale! I think it's time to CELEBRATE! The Princess & the Peddler Facebook page has reached over 3,000 page 'LIKES' and that's a milestone for which I have been patiently awaiting. A HUGE thank you to you all. The Peddler and I are humbled and we want to thank you by offering a sale! 25% off your order of $20.00 or more! Just enter 'CELEBRATE' in the coupon field at checkout! We are planning on offering more kits to make your shopping easier. The threadpacks with the kits will be offered using the called for threads, or when possible, DMC alternatives. We will be adding the 'kit' options to the website soon. And, as always, any of our patterns can be made into a kit, so, if we haven't gotten around to offering a pattern you want as a kit, please just email us. We'll be happy to put one together for you. 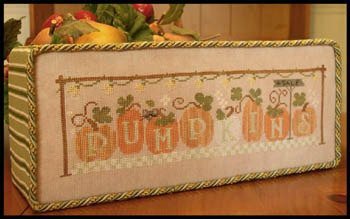 And to 'CELEBRATE' the advent of one of many of our favorite seasons, we are showcasing this wonderful pattern by Little House Needleworks - 'Pumpkins 4 Sale'. This is available as just the pattern or a kit, with hand dyed linen. We LOVE this one! Stay tuned for LOTS of FUN things happening here at the Castle. Sales, giveaways, special products and much more are in your future! Thank you all again for making this such a fun business to be in! Love you all. Until next time, be kind to each other.